Who: Anyone interested in colt starting and improving their horsemanship skills. Grab a cup of coffee and settle in to watch a clinic with Tristen Baroni, from the comfort of your home. No need to stand around stamping your feet to keep warm for this clinic. Tristen, the trainer for Meyer Company Ranch Horses, will be filmed at the beautiful Meyer Company Ranch near Helmville, Montana. This clinic will focus on general horsemanship skills demonstrated on Meyer Company sale horses. Tristen’s main focus is always improving the working relationship between horse and rider, and understanding how to communicate more effectively with your horse. Tristen will have a fellow horseman and client riding with him through out the day. 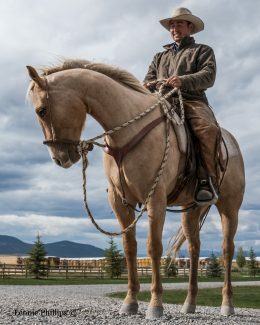 You’ll see the beginnings of basic maneuvers on a young stallion as well as more advanced horsemanship techniques taught to another horse that’s ready for the next steps in his training. Stay tuned for an upcoming survey where you’ll have the opportunity to ask Tristen questions, and be entered to win some fun prizes. Read more about Tristen and watch some of his videos on Cavvy Savvy.